Industry Standard E6Golf Simulator Now Integrated With FlightScope Xi-Series. TruGolf Brings Its List of World-Class Courses and Best-Selling Golf Simulator to FlightScope Xi-Series Users. "Golfers now have access to the best courses in the world, any time of the year." TruGolf has announced that its golf simulation software, E6Golf is now fully compatible with the FlightScope Xi-Series. The partnership is part of TruGolf’s effort to grow virtual golf and connect golfers around the world. Now, users will be able to log in, play, and join online events hosted by E6Golf with their FlightScope device. “Accurate club and ball data from FlightScope, together with E6 simulation software provides an overall unique solution for teaching, fitting and entertainment. FlightScope is very excited to be a component in this affordable integration,” says Vice President of Sales Madelein Nel. Now, high-end golf simulation is available for all golfers. 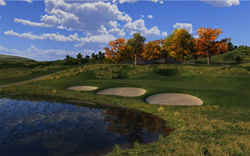 E6Golf is known for its realism, beauty, and world-class course list. The latest installment, E6Golf version 1.6, features updates to the lighting module, terrain texture, and physics, making it the most accurate golf simulator available. Additionally, the software features 36 Modes of Play, Climate Control, Elevation Control, In-Game Practice Modes, and Boost for beginners and younger players making it the most versatile software available. E6Golf offers 23 of Golf Digest’s 2015-16, America’s 100 Greatest Courses, and Top 100 Public Courses. It features over 30 regular PGA, LPGA, Champions Tour, and Ryder Cup venues. Additionally, the course library includes designs from: Jack Nicklaus, Arnold Palmer, Robert Trent Jones, Robert Trent Jones, Jr., Donald Ross, Tom Fazio, and Pete Dye. TruGolf, originally a subsidiary of Access Software, formally spun-off from the company in 1999 when the company was purchased by Microsoft for its expertise in golf software development. Since then, it has continued to refine and build the most realistic golf simulator available. Its previous title Links is the most-awarded and highest selling PC sports title of all time.